Another year, another bike ride. 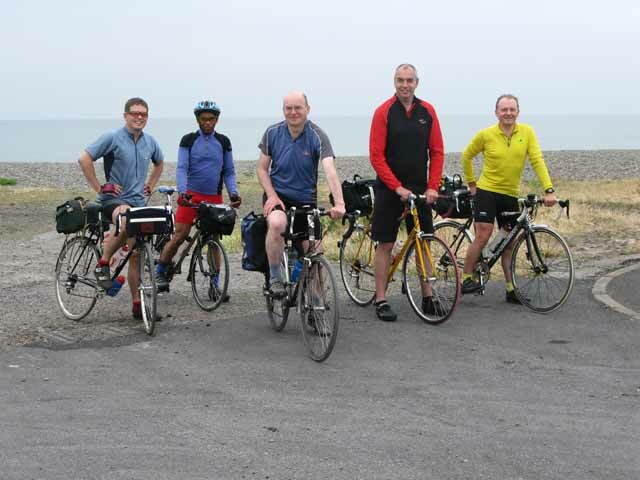 Options floated for our 2009 ride included Derby to York, Ayr to York, and a foreign adventure taking in five countries. We opted for a coast-to-coast ride based on the Walney to Wear (W2W) route. The W2W runs from Walney Island, near Barrow-in-Furness, across the Pennines to Sunderland on the east coast. 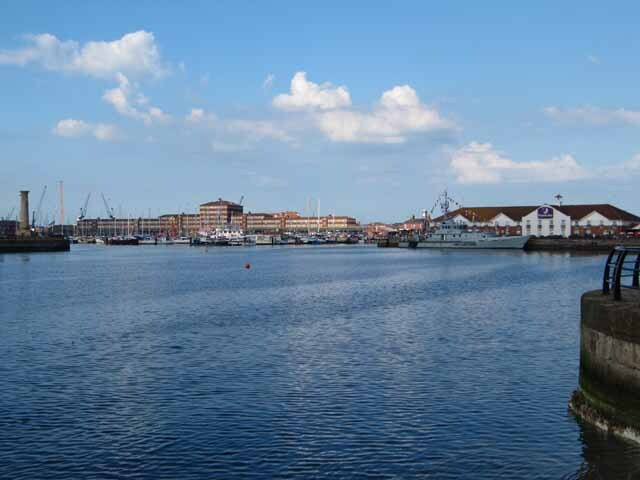 Our route would follow the W2W as far as Durham, then take an alternative cycle route to reach the sea at Hartlepool. On the third and final day we would continue south to York via the North York Moors. 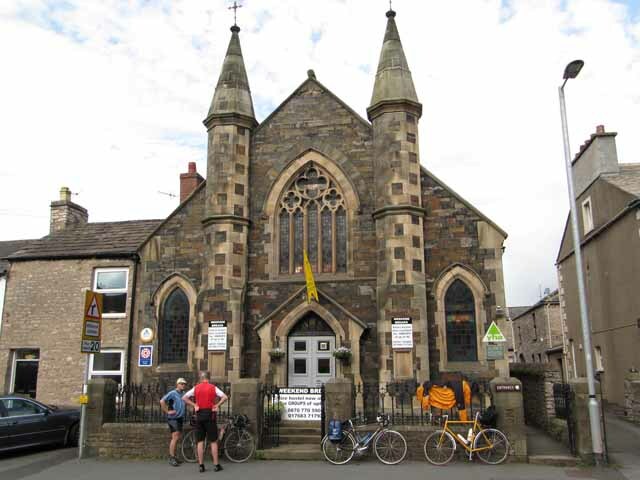 Overnight accommodation was arranged in advance in Kirkby Stephen and Hartlepool. The riders were the usual suspects, the same six as the year before: Paul (Veggie), Jim, Brent, Greystone, Andy and myself. Paul and Andy decided to stay in Barrow the night before the start of the ride, whereas I stayed at my mother's in Lancaster. The others caught a train from York in the early hours of the morning. I joined the 07.38 train from Lancaster to Barrow, and found Greystone, Brent and Jim already on board. I had no difficulty in finding a space for my bike on the train, even though these Transpennine Express services are officially limited to carrying only two bikes. In fact, I reckoned that at one point there were 8 bikes on the train. The weather had been very hot for the previous few days, but today was cooler with rain forecast. The next two days should be cool and showery. Andy and Paul were waiting for us at Barrow station, and we made our way through the town and over the bridge onto Walney Island. Paul had an early altercation with a car driver, but physical violence was avoided. Where the road ends at the beach, we paused for a photograph and then retraced our route, continuing past the station on the road towards Furness Abbey. We stopped for more photos by the ruins of the abbey, then followed minor roads through Lindal. 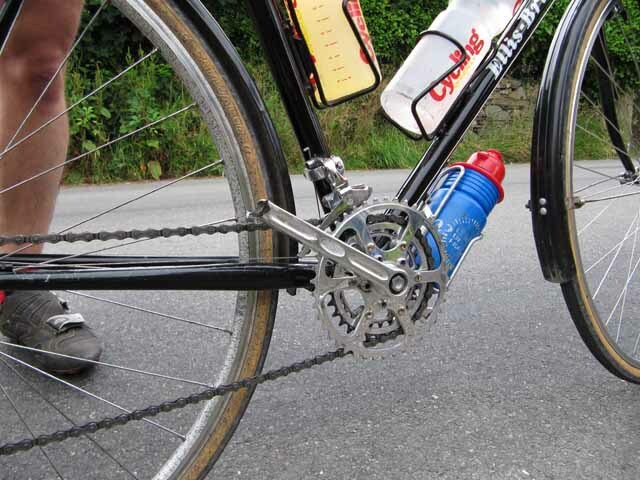 As we were climbing a hill near Pennington, one of Andy's pedals broke off, causing him to come to an abrupt halt. The end of the crank had fractured, and we all spent a few minutes inspecting the damage. Andy was on the point of giving up and catching a train home, but we had established from our W2W map that there was a bike shop in Ulverston. This would be a painful experience for Andy, as it would require him to open up his wallet, but we were able to persuade him to struggle along one-legged for the next two miles into the town. 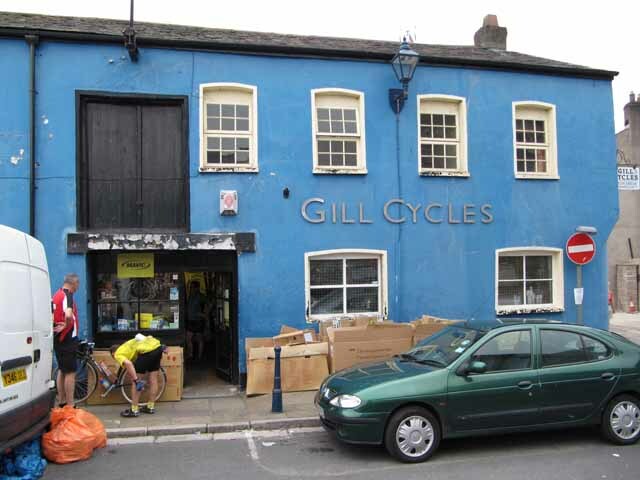 After asking directions three times, we found our way to Gill Cycles. "Lend me the tools and I'll do it myself" was Andy's attempt at avoiding paying any labour charges. He is used to buying all his components cheaply on eBay and fitting them himself. But it wasn't as simple as that here. Firstly, they did not have a suitable size of extractor for his 25-year-old cranks, and had to get an alternative tool from a nearby car garage. The rest of us decided to visit a cafe while the work was carried out. When we returned to the shop we found them still struggling, and the new cranks would not fit, so a new bottom bracket unit would be needed. By now we had been delayed about 1½ hours, and we decided to cut our losses and leave Andy behind. He had tears in his eyes, but that was the prospect of receiving the bill rather than us leaving him. A few spots of rain were falling as we left Ulverston, and it got steadily heavier, forcing us to put our waterproofs on before long. We stuck to the signposted W2W route, which took us through Cartmel, Allithwaite, Grange-over-Sands and Meathop, mostly on minor roads which would have made for very pleasant cycling had it not been for the rain. We had originally planned on making a detour off the W2W to go into Kendal for lunch, but with running late we decided to stop at Low Sizergh Barn instead, which was on the route. We entered, with water dripping off us. It is a very popular place, selling locally sourced food in the shop and cafe. The rain was falling heavily when we finished our lunch, so we waited for a while in the shop, hoping it might ease off. When it did, Greystone discovered that he had a flat tyre, so there was a further delay while he changed the inner tube. We finally started out feeling cold and wet. In the village of Sedgwick, there were scarecrows all over the place, as part of a festival. At Crosscrake, we made a right turn and shortly afterwards Paul stopped with a puncture. Some of us continued as far as the railway to watch trains go past while Paul changed his tube, and on his arrival I queried the route, as we seemed to be heading south, away from Oxenholme which I knew was on our route. Paul got his W2W map out, and we worked out that we were not only off the route, but off the edge of the map. We returned to Sedgwick and this time took the correct road to Natland, then on through Oxenholme on quiet, undulating roads. There were a lot of stones and debris on the road, and as I rode over a pile which extended right across the road, I heard a hissing sound from my back tyre and it quickly went flat. While I was repairing it, Paul and Jim decided to carry on, as they were beginning to get cold, but Brent and Greystone waited with me. I was unable to get the tyre properly seated again, so had to set off with it giving me a bumpy ride. As we were so late, we now started taking short cuts, so we used the main road between Lowgill and Tebay instead of the signed route on minor roads. We reached Orton (back on the W2W route), but then headed towards Kelleth and the A685 as the shortest route to Kirkby Stephen. Greystone and Brent were racing ahead and I found myself unable to keep up: my legs were tired, I was hungry and I was bumping along on my wonky back tyre. I just decided to continue at my own pace, stopped to eat a flapjack, and took a detour through Ravenstonedale village to relieve the monotony of the main road. There was a long uphill section which drained all the remaining energy from my body, but then a final downhill stretch into Kirkby Stephen, where I arrived just before 7.30. Andy had been first to arrive, as he had taken the train from Ulverston to Arnside and got ahead of us while we were having lunch. We checked into the Youth Hostel and got cleaned and changed. We called in at one pub, hoping to get a meal, but it was full and they did not expect any tables to become free until after they stopped serving meals. But we were able to go over the road for takeaway Chinese meals, and we were allowed to eat them in a pub over the road, where the Jennings slipped down nicely. Most of us took advantage of the cooked breakfast offered at the YH for a reasonable price, and by pumping up my back tyre harder I was able to get the tyre bead to pop out and seat correctly on the rim. Thankfully, no more bumpy ride! We started out from Kirkby Stephen at 9.30, in the sunshine, climbing gently at first to get us warmed up before attacking Tan Hill. 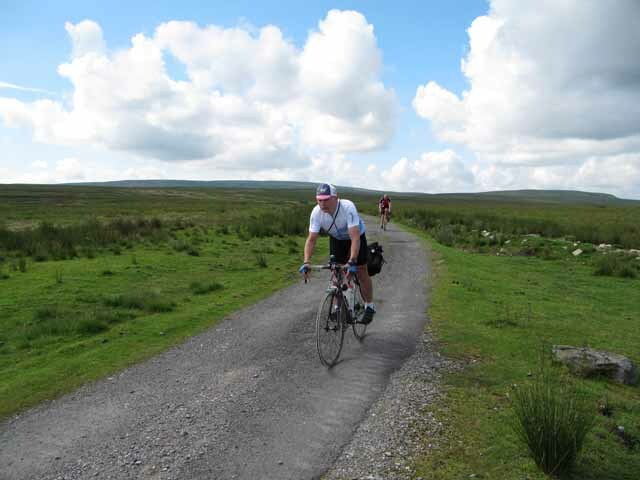 It was a long climb to Tan Hill, but not too hard as periodically the gradient eased off, allowing a bit of a breather. We stopped for a few minutes at the pub at the top, but it was too early to call in. We planned on having a tea stop in Bowes or Barnard Castle, and lunch in Bishop Auckland. From Tan Hill, the W2W follows a track across Sleightholme Moor. This was quite rough in places, but we all got across without any punctures. Back on proper roads, near Bowes, Andy had a puncture, but the rest of us carried on to Barnard Castle. We stopped at Penny's cafe, and as it was after 12 we decided to have lunch while waiting for Andy to catch up. In the event, Andy decided to carry on ahead of us, as he had some food with him. We caught up with Andy just as he had finished repairing another puncture. There are two alternative sections of the W2W here, and we took the southern route through Bishop Auckland. Brent's bike now developed a problem, with a broken mudguard clip which caused the rear mudguard to rub against his wheel, so we had a short stop in Bishop Auckland while he bought and fitted a new clip. From Bishop Auckland we followed an old railway most of the way to Durham. This had quite a good surface, but on the approach to Durham Paul decided that we should leave this route and use roads to head for the Museum Quarter to the south of the city centre, where there should be some cafes. We made the mistake of following road signs for Durham, which took us a long way round and brought us in on a fast dual carriageway, which was not very pleasant. Anyway, it brought us into Durham from the south and we were able to stop for tea at the cafe in the University Botanical Gardens. Our route out of Durham took us away from the W2W, and began with a long climb to Sherburn Hill. We were aiming to get onto another old railway cycle route, but at the first bridge we came to, there was no means of access to the track below. We finally got onto it near Shotton Colliery, and from there it was an easy ride, gently downhill on a fairly good surface and a surprising absence of broken bottles. The final mile or so into Hartlepool was on roads, and we made an error and ended up at the Headland on the north side of the harbour. Eventually we found our way into town and the Marina area, which was busy with Dockfest 09. 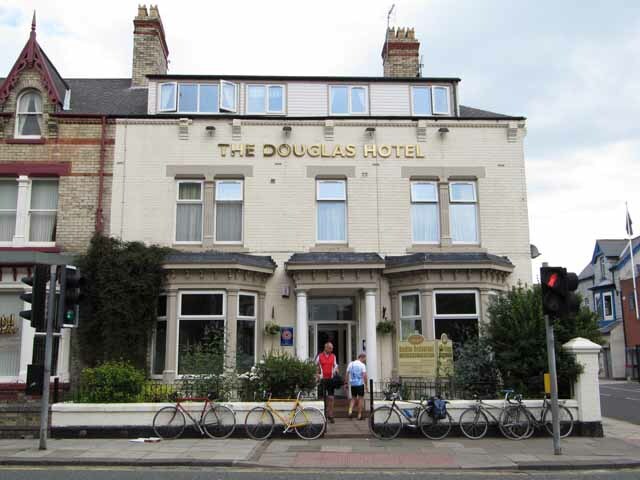 We checked in at the Douglas Hotel just outside the town centre. We had been lucky with the weather, as a heavy shower fell while we were getting showered and changed. A quick tour of pubs in the area was unsuccessful in finding us a combination of good beer and food, and we ended up eating from a take-away. We then went to the Jackson's Arms but only had one drink in there, as it was very noisy. We finally settled in the Causeway Inn, where we could sit in comfort and discuss the finer points of our ride. I think we were in agreement that Hartlepool was better than Barrow, but it was remarked that cross-country bike rides seem to go from dump to dump. Jim thought that Salford to Scunthorpe could be an option for our next ride. We achieved a 9.30 start again, and started out by following a signed cycle route along the shore to Seaton Carew. It was fine but cloudy. We took A roads through industrial areas to Port Clarence, but as it was a Sunday morning the roads were fairly quiet. We arrived at the famous Transporter Bridge over the River Tees to discover that it did not operate on Sunday mornings, so after a few photographs we headed upstream to the Newport Bridge. This was also closed to road traffic, but fortunately was accessible to cyclists (otherwise it would have been the busy A19). 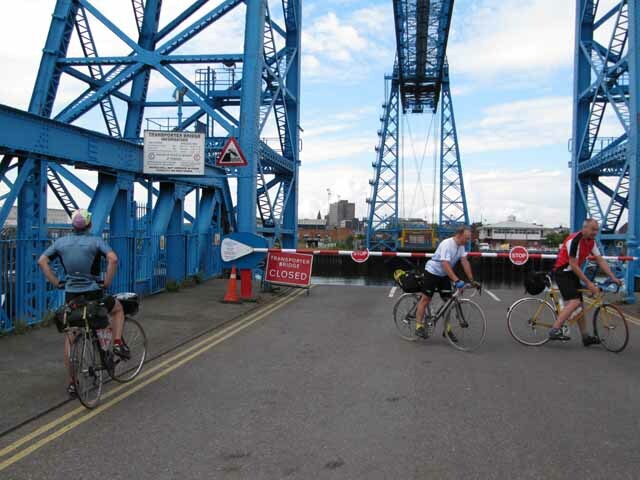 We carried on through Middlesbrough, Acklam, Stokesley (by-pass) and Great Broughton. This road was busy with traffic heading for the North York Moors. It was a steep pull up Hasty Bank, and we didn't see any tea wagon at the top so we carried on. The pub at Chop Gate was not yet open, so we decided to continue to Helmsley and have lunch there. We got spread out over the next few miles, even before we reached the next steep hill at Newlands Bank. 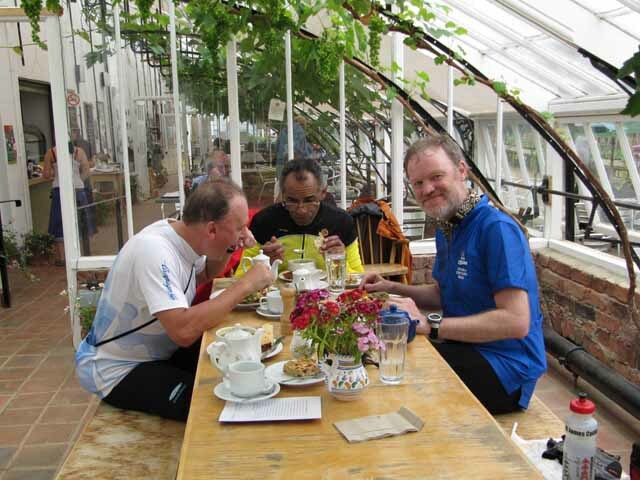 There was a heavy shower, then a fast descent into Helmsley, where four of us convened at the cafe in the Walled Garden (Jim and Andy had decided to press on with only a brief stop in Helmsley for a snack). After a good lunch, we left Helmsley on the B road towards York, but Greystone soon parted company with us, as he was heading for home in Bridlington. Paul, Brent and I rode on through Ampleforth, Yearsley and Sutton, making good progress. We arrived at the Maltings in York at 3.35, and found Jim and Andy already there. It had been a good final day, with no punctures, breakdowns or wrong turnings.